*Note: CFOI data for 2018 have not been released. 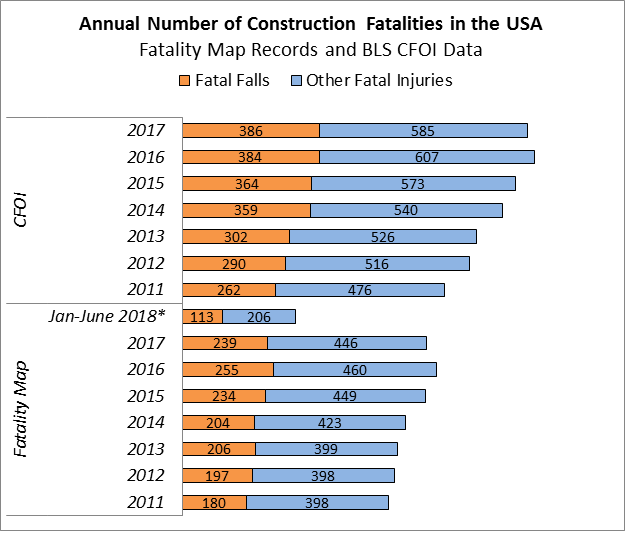 As a point of reference, during the ten year period preceding the construction downturn, which began in 2008, BLS reported roughly 1,200 construction fatalities annually. Prior to the downturn and since, falls have accounted for roughly one-third of work-related deaths suffered by construction workers each year. For 2011, CPWR included OSHA records of suspected or confirmed on-the-job heart attacks and aneurysms. Ten deaths of this nature were included. Starting in 2012, in order to be more consistent with BLS data, CPWR excluded confirmed and suspected heart attacks and aneurysms, unless coupled with a traumatic injury. For instance, a worker who suffered a heart attack before falling from a ladder would still be included in the maps from 2012 onward. Deaths described as “occurring due to natural causes” were excluded for all years. Events in which the cause of death was unclear or unknown (e.g. a worker found dead on a worksite with no witnesses to the incident) were included.